Item SPITCH * Porcelain 20oz Pitcher: This 19 oz. sublimation pitcher can be personalized with your favorite image or picture and used for sauce, gravy or a beverage. The porcelain pitcher pours great and can be decorated with either a mug press or our sublimation wrap. 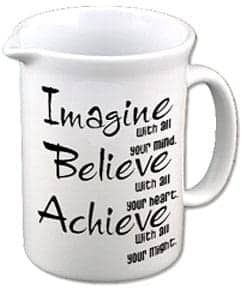 * Print transfer and attach to the pitcher using a heat resistant tape. Wrap the pitcher with pellon or plain white paper. * Remove the pitcher from the press and remove the transfer immediately. Place the pitcher in room temperature water to cool and to stop the sublimation process..